These two tiny brick quilts are my most recent finishes. I tend to get "stuck" on a particular design and go with it in a variety of colour ways or sizes. So three tiny brick quilts finishes and three more have the bricks cut out. 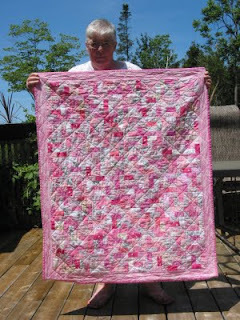 They will be donation quilts when my guilds resume in September. The final Scrap Bag Quilter session of the season was last Wednesday. We tied 10 quilts and sent them home with different members to have the binding completed over the summer. I only have one to do. 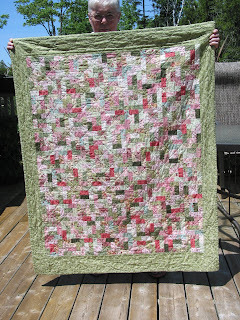 In May I enjoyed a variety of quilting experiences. The Quilt Pocket (a yahoo group) held Jambo 2011 in London and I attended that. What a fabulous time. The organizers had thought of everything. We stayed in a Community College residence. There was time for sewing, time for sharing, time for fun, time for eating, especially chocolate and time for shopping. And a couple of us even managed to sleep a little. Then two weeks later Quilt Ontario happened in London. I signed up for two classes. Karen Combs More Patchwork Illusions and Ursula Reigels QAYG Apple Core Table runner. Both classes were great. I have one project almost done and the other is close to finished. The shows associated with the event was inspirational. Although I have come to terms with the fact that I will never be an "Art Quilt" type of quilter. Then in another ten days some friends locally organized and held a retreat. Again a well organized event with lots to do, sewing time, eating time, a couple of games and just great fun with friends. I have hit the half way mark on my 50 quilts from stash this month. The list just needs to be updated. That's about it for now. I want to get the binding attached to my Scrap Bag quilt so I can stitch in the evening. And my nephew is getting married next month so I would like to actually finish his quilt before the wedding.